Updated Friday October 28, 2016 by Mission El Camino Soccer Club. Company name and logo on Mission / El Camino Soccer home page with a link to your website. Option to display your own company banner at picnics/events. Company name displayed on "Thank You" banner at club picnic. 8 x 10 photo plaque of the sponsored team. Company name on Mission / El Camino sponsor page. 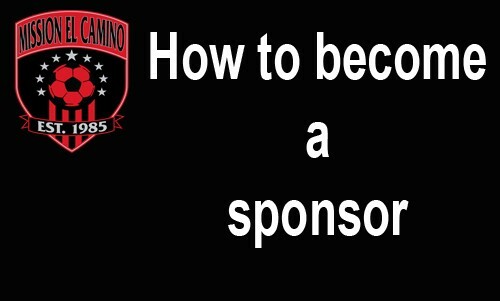 If you would like to become a sponsor of Mission / El Camino Soccer, please contact Jasen Yelton at POLARLORD@aol.com or 916-240-6002.